Web content writer, social media marketer and researcher. A web content writer, social media manager & researcher at Amaris-solutions. I work with an IT solutions company that specializes in back end software programming & web development. Previously, Michael worked as a research & financial accounting associate for a multinational company. 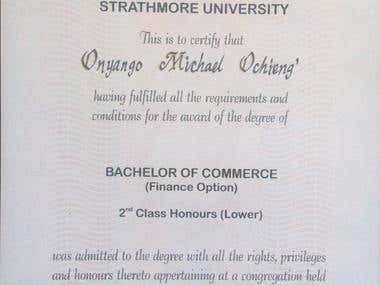 He graduated with honours & espouses to deliver quality at all times. He has a great attitude to work. 1. Accounts payable & receivables 2. Remittance of monthly statutory deductions 3. Posting food offers by restaurants listed within the company's website. 1. Review invoices for appropriate documentation. 2. Remittance of monthly statutory deductions. 1. Oversee costing of products. 2. Processing of documents. Completed a full training on Search and Display advertising.